Start by cooking your bowtie noodles in water that’s been generously salted. In a large non-stick pan, start wilting down the spinach with a small pinch of salt and a teaspoon of oil (your choice); set aside to cool when it’s all cooked down. As you cook the pasta and wilt the spinach, reheat your prepared or jarred pasta sauce in a deep sauce pot. To this, add your freshly cooked (if you had time to make any, of course) or frozen meatballs, the tomato puree, some freshly picked and cleaned Thai hot basil (if using dry leaves, half the called for amount; whole or chiffonade) and freshly cracked black pepper. Let that cook long enough to heat the meatballs all the way through. Note: If you don’t have fresh or dried out Thai hot basil leaves, fresh sweet basil will be fine in the sauce. We like a bit of zing in our lasagna sauce, so that’s why I grow Thai hot basil in my garden. Scoop out a bit of the pasta sauce to spread all over the bottom of your lasagna pan thinly. Scoop out a few more spoonfuls of just the pasta sauce and set aside (this is for the topping). When your pasta is done cooking, drain it well. Layer more or less than half of the cooked pasta over the sauce in the lasagna dish. (Only use enough to cover the sauce, otherwise this lasagna will become very bulky.) Over the pasta, place a generous amount of sauce with half of the meatballs to cover the pasta noodles, but not much more. Over the sauce and meatballs layer, lay half of your wilted spinach all over and top that with a few blobs of ricotta cheese; (I use a medium size offset spatula to) spread the ricotta over the spinach in an almost opaque layer. Top the ricotta with the second half of your pasta noodles and top them with the last of the sauce and meatballs. Top those with the last of the wilted spinach, and then top the spinach with the last few blobs of ricotta spread out and the reserved pasta sauce before finishing the lasagna with your two grated cheeses (and toasted breadcrumbs if you like). This entry was posted in Food Experiments, Pasta on March 15, 2019 by Stacey. Sometimes what you envision in your head doesn’t always work out in the final version. Sometimes you need to go back to the drawing board, and sometimes you just need to tweak the great idea you started with. That’s where I am with these pappardelle noodles. I made them wide and long. I thought that was best. What I didn’t think was how it was going to be eaten, in practical terms. I cooked my first test batch last night and realised there was no way to twirl the long noodles on a fork. None at all. Trust me, I tried! And for the first time my husband’s suggestion that I wear a white tea towel tucked into the front of my shirt as I ate didn’t offend me. It actually came in quite handy. Instead of stain removing tomato sauce from my laundry tonight, I was able to take the remaining noodles and break them up before I dropped them in the pot. This helped. A lot. I still needed to use the side of my fork to break down large chunks of noodle, but none of it found its way to my clothing. Win! Plated pappardelli noodles in sauce, topped with fresh pepper and Parmesan shavings. Anyway, this is the before and after of my pappardelle. I didn’t make anything fancy for this one because it was more about the noodle than the sauce tonight. It still turned out quite tasty, though. You can’t go wrong with a basic Marcella Hazan tomato sauce. You really can’t. All you have to do it top it with fresh pepper and shavings of Parmesan cheese, and you’ll be all set to feast. This entry was posted in Food Experiments, Yummies on September 24, 2011 by Stacey. Years ago, Adam from BlogHungry posted his recipe for Personal Vegetable Lasagnas and I fell in love with the idea and his recipe. This is my interpretation of it. My husband liked the idea but he hated the execution because (shocker) it was meatless. (Right?) Anyway… I loved it. Make it. Tell me, and Adam, what you think of his creation. This entry was posted in Food Experiments, Yummies on August 20, 2011 by Stacey. This entry was posted in Food Experiments, Links on August 16, 2011 by Stacey. 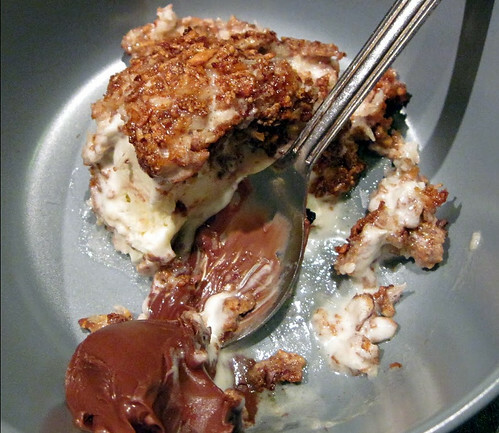 Deep Fried Ice Cream, a photo by Pastarella Maker on Flickr. Deep fried French Vanilla ice cream, served with a bit of Nutella for good measure. [Recipe via ZoomYummy.com] Addendum: I used smashed up kamut cereal for the coating because I don’t like or eat Corn Flakes. I’m sort of a snob like that. Heh. This entry was posted in Boasting, Food Experiments, Yummies on August 12, 2011 by Stacey.